At least fifty-four people were injured when a morning commuter train in Barcelona collided into a railway buffer, according to emergency services, but the cause of the crash is currently unknown. A commuter train slammed into the end of the platform during the morning rush hour at a busy station in Barcelona on Friday, leaving 54 people injured, emergency services said. One person was seriously injured, 19 were injured “less seriously” including the driver, and 34 were lightly injured in the accident at Francia station in the centre of the Spanish city, local emergency services said on Twitter. A French citizen and a Romanian were among the injured, a spokesman for the civil protection agency said. The rest were Spanish nationals. The regional train, travelling from the town of Sant Vicenc de Calders, ran into buffers at 7.15am (1.15pm Singapore), a spokesman for Spanish train operator Renfe said. At the time of the accident many passengers were standing up in the busy carriages, which increased the number of injuries. “At the moment of impact I had the feeling of experiencing an earthquake. People were swaying back and forth and colliding into each other,” Lidia, who was travelling in the first carriage of the train, told Catalan newspaper La Vanguardia. “Many people fell to the ground because people were standing up and I saw several people with cuts to the head and face from the blows they suffered when they fell,” she added. Pictures from the scene posted on social media showed the interior of the train covered in shattered glass. Others showed firefighters treating injured commuters on the platform. The train did not brake when entering the station, a security guard who works at the station, who declined to give his name because he was not authorised to talk to the media, told AFP. “It was going at normal speed, it did not brake and it crashed into an iron pillar,” he said. The front of the train was crumpled by the impact. Officials covered the damaged front in blue plastic, TV images showed. The streets around the station, Barcelona’s second busiest which is known as Estacio de Franca in the regional Catalan language, were closed off to allow emergency vehicles to get through. 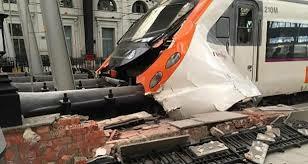 An investigation into the cause of the accident has been opened, the spokesman for Renfe said. The accident coincided with the start of a national rail strike which forced the cancellation of hundreds of trains. It was not immediately clear how many people were on the train at the time of the accident, an emergency services spokeswoman said. The head of the regional government of Catalonia, Carles Puigdemont, was at the scene of the crash and Public Works Minister Inigo de la Serna announced that he would travel to Barcelona. “I am following closely the developments regarding the commuter train crash in Barcelona. I wish a quick and completely recovery for the injured,” Prime Minister Mariano Rajoy said in a Twitter message. The accident comes as Spain this week marked the fourth anniversary of one of the country’s worst rail disasters in which 80 people died in 2013 near the northwestern city of Santiago de Compostela. The train from Madrid crashed as it hurtled round a sharp bend at 179km per hour – more than twice the speed limit for that stretch of track – in the village of Angrois. The driver of the train is facing trial, but under pressure from associations representing families of the victims, officials have reopened their investigation to see if there was negligence on the part of the railway firm.